Note: I know that the whole ForeFront family is no longer supported by Microsoft (alas!). But TMG is a great product, it's still in use and there are companies still selling & supporting it. So I feel that sharing this info still can be useful for someone. ​​​​​​​​​​​​​​The ForeFront TMG doesn't allow out-of-the-box to push routes for specific subnets to VPN clients. or add an entry to routing table based on class (A, B or C) to which the assigned IP address belongs. 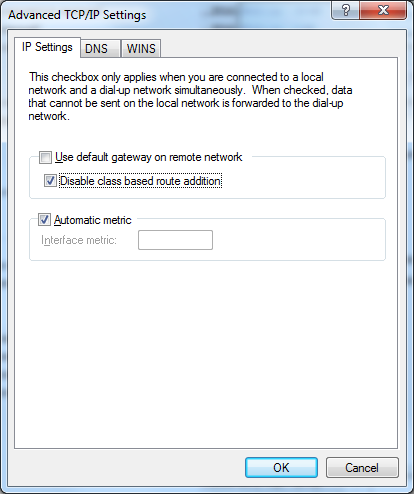 For instance, if granted address is 10.3.4.5, then Windows VPN client can add route to the whole class A subnet - 10.0.0.0/8 - towards VPN. 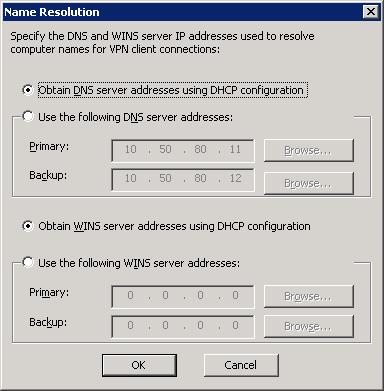 ​If we don't want either of these options, then the only way is to configure TMG to request addresses for its VPN clients from DHCP. 1. 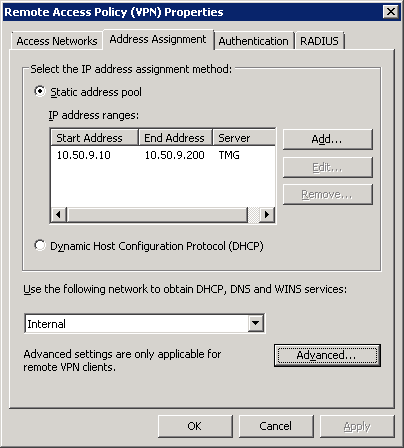 In TMG Management console, go to "Remote Access Policy (VPN)" and then click on "Configure address assignment method". The very first address of this range - in this case, 10.50.9.10 - will be used as address of DHCP relay agent (the GIADDR field in DHCP request). This is important, because DHCP server uses GIADDR to recognize, settings from which scope should be used sent with the response (including the static route options). 2. Now we need to launch the "Routing and Remote Access​" console, expand the local TMG host node , expand IPv4, right-click General, select "New routing protocol..." and add DHCP relay agent. We need to configure it with the address of our DHCP server and add "Internal" to its list of interfaces. This Internal interface isn't related to Internal network in TMG Management console, appearing on the screenshot above. It represents VPN clients. N.B. The address in "Router" field can be anything, as long as it falls inside the subnet range. It doesn't really matter - when the route is pushed into VPN client's forwarding table, the "Gateway" will be set to "On-link", since its point-to-point connection. 4. And the last thing - configure the Windows VPN client itself. unmark the "Use default gateway on remote network" option - we don't want to add route for 0.0.0.0/0. mark the "Disable class based route addition" - we don't want route for the whole 10.0.0.0/8 subnet. ​TMG will select some address from its static address pool - let's say, 10.5.9.11.
address of the DHCP relay agent (the GIADDR field) - which is the first address in the pool, 10.5.9.10. 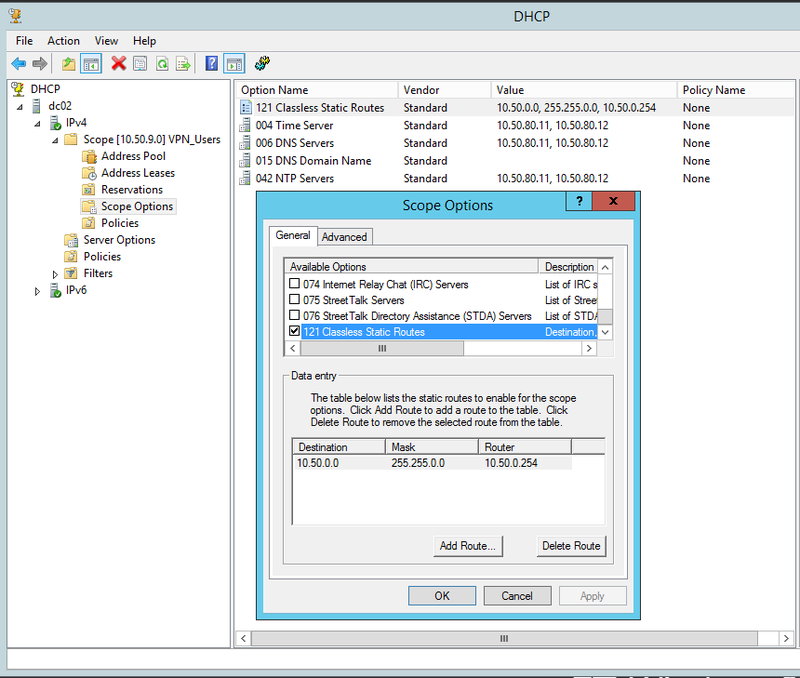 ​The DHCP server will use the GIADDR field to find relevant scope and make sure that the requested address is available. Then it will reply with "DHCP Ack" mess​age, which will carry the options defined to this scope - including the "Classless Static Routes" option. TMG will relay this packet to the client. Note the route to 10.50.0.0/16. 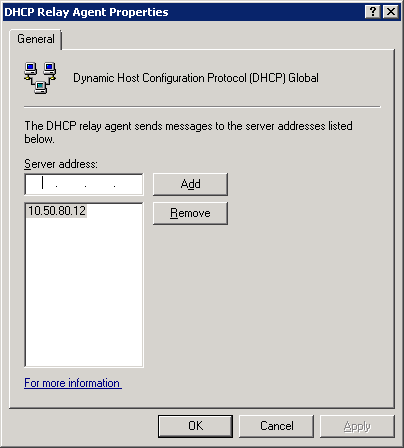 The DHCP_Inform_and_Ack.pcap file contains example of packets exchange between the relay agent (TMG) and the DHCP server.